If you’re a little grumpy and sleep-deprived this time of year, you’re not alone. But as soon as the paperwork is neatly filed away (or hurtled across the room – whatever your filing method), take yourself out for some tax day freebies and deals to celebrate the end of the tax season. Some of the deals are only valid on April 15; others are good before and after. All of these deals are “EZ” to love! We’ll update the list as more deals come in, so make sure you check back often. As is always the case, please double-check on these deals before you order. Sometimes a location doesn’t participate in a national deal. Also, some of the deals this year will require that you participate in loyalty programs. All Star Wichita will have a Tax Day sale on April 15. A “Pick 3” attraction pass will only cost $10.40 instead of the regular $19.99. Take your little deductions out for some after-school fun. Applebees offers its Neighborhood Drink of the Month every month, but in April this $1 strawberry margarita served on the rocks with a Twizzler might be a refreshing way to celebrate the end of tax season. BJ’s Restaurant & Brewhouse is celebrating the official end of tax season on Tax Day, April 15 by offering guests Half Off Large Deep Dish or Tavern-Cut Pizzas available Dine In, Take Out or Delivery. April 15 will also kick off three weeks of free delivery and no service fee on delivery orders via bjsrestaurants.com (free delivery offer ends May 5). 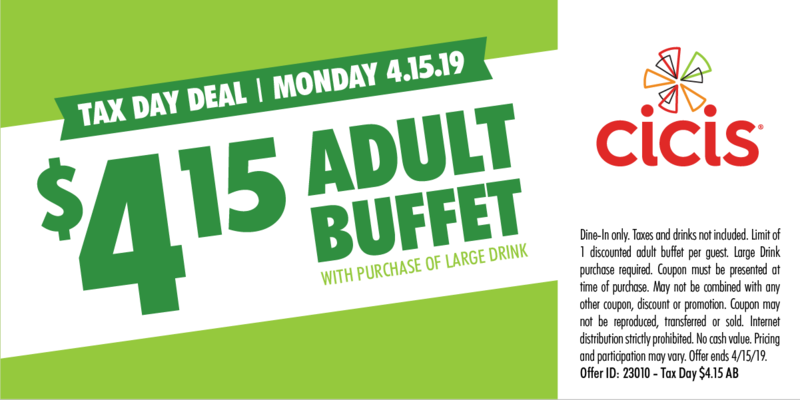 Cici’s Pizza eases your tax day burden on 4/15 with an adult pizza buffet for only $4.15. Unlimited pizza and endless cinnamon rolls are probably an effective – if not super healthy – way to drown your tax day sorrows. You’ll need this coupon here. Dunkin’ (Dunkin Donuts) is offering its DD Perks® Rewards Members a Medium Hot or Iced Coffee for $1 all day, Monday, April 15 at participating Dunkin’ restaurants. 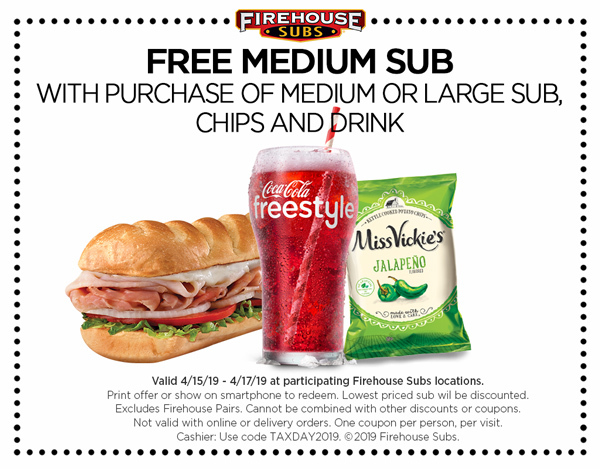 Firehouse Subs is providing some tax day relief with this coupon for a free medium sub when you purchase a full price medium or large sub, chips and a drink (valid Monday April 15 through Wednesday April 17). Hardees will help you start Tax Day morning with a little sustenance. At participating locations, show up between 7 a.m. and 10 a.m. on April 15, 2019 and say “Made from Scratch” when ordering to get a FREE made-from-scratch Hardees sausage biscuit. Noodles & Company is giving its NoodlesREWARDS members $4 off orders of $10 or more for Tax Day when you order online or through the mobile app from April 10 to April 15. To get this tax day freebie, you need to be signed up for NoodlesREWARDS by April 9. Office Depot: Say hasta la vista, baby to all that paperwork with up to 5 lbs. of FREE document shredding at Office Depot through April 27. You will need the printable coupon to get the deal. While we’re on the subject, Free Shred Days are scheduled across Kansas to help you dump the old paperwork and make room for this year’s. Old Cowtown Museum still has its April membership special! While not technically a “tax day deal,” it will give you a return all year long. The entire family (two parents and all the kids under 18) can go to Cowtown with this one family membership, which is on sale in April for just $55 per year. Yeah – per year. Orbitz is giving you a tax refund this year when you book on April 15. They’ll match all taxes and fees on your purchase in “Orbucks” for use on a future trip. Go to orbitz.com/taxday for more info. Pizza Hut is offering a large range-topping pizza when you carry out until 4/15. The deal is on their home page. Planet Fitness has a relaxing tax day freebie from April 11-20. Members and non-members can use available HydroMassage chairs with a coupon that will be available beginning April 11, 2019. Schlotzsky’s is giving customers one free small The Original sandwich with the purchase of a medium-sized drink and chips on Tax Day 2019 (April 15). Smoothie King’s Healthy Rewards app has a Tax Day deal to save you some green with $2 off any smoothie April 15-17, 2019. You do need to use the app to get the deal. Thanks to Living On The Cheap for help in compiling this list! Sonic is also doing half price cheeseburgers all day for Tax Day.